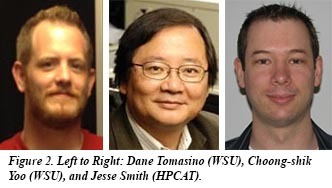 In a paper recently released in Physical Review Letters, a group including CDAC graduate student Dane Tomasino, CDAC Partner Choong-shik Yoo (both from Washington State University), and Jesse Smith from HPCAT, report the significant discovery of a novel layered, singly-bonded polymeric form of nitrogen (LP-N). The material is synthesized by laser-heating nitrogen at pressures between 125-180 GPa. This new material exhibits a wide range of novel properties, including a colossal Raman cross section, at this point the largest of all known solids. Other properties include extremely high density (ρ=4.0 g/cm3), even compared to diamond (3.5 g/cm3), a large stiffness (Ko=345 GPa) rivaling superhard cubic-BN, and a potentially high energy density exceeding its sister phase cg-N and five times that of TNT. Only a few solids can have all these properties together. This places LP-N in the class of materials such as diamond and graphene, which can potentially lead to materials innovations in the future. 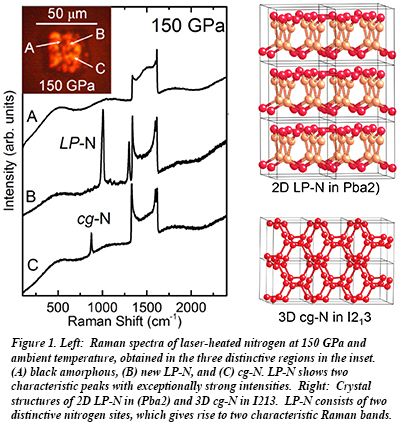 Importantly, the studies of LP-N also provide a new constraint on the nitrogen phase diagram, highlighting an unusual symmetry lowering 3D cg-N -> 2D LP-N transition with pressure, in contrast to more commonly found 2D to 3D transitions such as the graphite -> diamond. The transition from cg-N to LP-N points to an enhanced electrostatic contribution to the stabilization of the densely packed layer structure of LP-N [D. Tomasino et al., Phys. Rev. Lett. 113, 205502 (2014)].